Gray Falcon: What, me worry? Rumors of my retirement following the formation of a Yellow-and-Red government in Serbia have been wildly exaggerated. I'm a libertarian, remember? When one believes that all governments are bad, and some are worse than others, seeing a really rotten government ascend to power is hardly a cause for despair. A sigh of exasperation, perhaps, maybe a bit of disappointment, but when one seeks to comment on the condition of humanity (or parts thereof) those come with the territory. May as well complain about the water being wet, or the summer being hot. Which it is, by the way. The world being what it is, I'll run out of time before I run out of material. So stay tuned. I'm just getting warmed up. I wish you would be more nationalistic Serbian than Libertarian,which is an abstract fad that can't solve any of Serbian problems. Democracy in our country has only strangled Serbian national aspirations by giving our ethnic minorities and foreign interference,an extraordinary leverage to throw a monkey wrench into any decision of National importance. 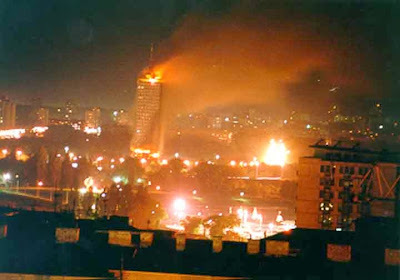 "war crimes" of the Serbs, they are misdemeanours compared to those of Georg W. Bush's :over one million two hundred thousand murdered Iraqis and the killings still going on. What we need isn't sterile and useless democratic games but a leader like Putin. Just to be clear... I share your dislike of democracy; it's an ideology hostile to freedom, and it patently isn't working, not just for us, but for pretty much anyone (except those who end up in charge). But what does it have to do with libertarianism? How is a belief in freedom and human dignity an "abstract fad"? The only leaders to trust are those that obey their constituency. Which is to say, almost none. Doubt and opposition are the only safeguard against tyranny. And opposition must continually find new and unnoticed avenues. History is a good place to start and a bad place to end.